On 18-19 July, Belarus officially welcomed a delegation of European parliament, and Latvian foreign minister, who made rather positive statements on Minsk's policies. These developments continued the process of Belarus' rapprochement with the EU and other Western structures. On 18-19 July, Belarus officially welcomed a delegation from the European parliament along with the Latvian foreign minister, who spoke up for Belarus’s policy of neutrality. These developments are signs that Belarus’s rapprochement with the EU and other Western structures continues. The annual session of the OSCE Parliamentary Assembly in Minsk on 5-7 July was a milestone in this process. 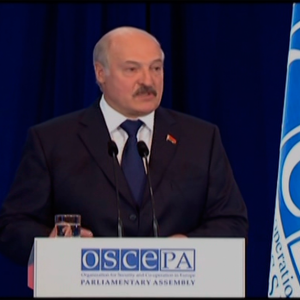 Indeed, Belarusian President Alexander Lukashenka commented that just three years ago he could not imagine a session of the OSCE Parliamentary Assembly in Minsk. The Belarusian government is finally reaping the rewards of its pursuit of neutrality between Russia and its opponents. Although this position has caused consternation in the Russian political establishment, Minsk has so far succeeded in minimising the damage. No more questions for Belarus? Thus, it seems that Belarusian leadership perceives the recent OSCE Parliamentary Assembly in Minsk as a success. The Belarusian authorities wish to build on this triumph: at the event’s opening meeting on 5 July, Lukashenka presented an ambitious idea for holding a major international conference aimed at achieving a détente between ‘Euroatlantic’ and ‘Eurasian’ countries – promoting trust, security, and peace, a so-called ‘Helsinki-2’. Minsk also has several other achievements under its belt vis–à–vis relations with the EU and European structures. On 19 July, after meeting his Belarusian counterpart, Latvian Foreign Minister Edgars Rinkēvičs announced that Riga no longer had any questions for Minsk concerning the forthcoming West-2017 military exercise. Rinkēvičs noted that while Latvia is a NATO member and Belarus is participating in the Collective Security Treaty Organisation, Riga ‘is respecting the choice of [its] neighbours in the field of security.’ At a press conference, Rinkēvičs agreed that Belarus-EU relations in recent years have become more rational and constructive. Andrejs Mamikins. Image: euroradio.fmOn 18 July in Minsk, for the first time in fourteen years, there was an official meeting between the deputies of the lower chamber of the Belarusian Parliament and members of the European Parliament (EP). Andrejs Mamikins, an EP member who attended the meeting, described the discussions there as ‘fierce’ but ‘completely friendly and sincere’ on Facebook. The first time in recent years that an EP delegation came to Minsk was in June 2015, but this did not constitute an official meeting. On the following day, the head of the EU delegation, Bogdan Zdrojewski, underlined that the meeting would not be considered official recognition for the Belarusian parliamentarians as ‘democratically elected’. Nevertheless, he believes it necessary to resume dialogue with Belarus. Moreover, the EP is studying possible ways to invite Belarusian parliamentarians to Euronest Parliamentary Assembly events. The statement is remarkably not only because of the president’s reservations regarding Belarus-Russia integration. Lukashenka was quoting a well-known Russian phrase coined by Soviet president Mikhail Gorbachev, ‘the process has started’ [protses poshol]. Since Gorbachev used it to comment on developments which later turned out to be out of his control, the phrase in this context has an ironic undertone. Belarusian Foreign Minister Makei made similar comments: in an interview with El Pais, he criticised the deployment of NATO troops in the region. However, he also mentioned how Minsk refused to host a Russian air base. We are categorically against the deployment of a NATO contingent in the Baltic countries and Poland because this forces the other party to respond and contributes to an escalation… a new [Russian] foreign military base in Belarus does not make sense, because modern armaments allow Russia to react equally rapidly from its own territory. Minsk’s rapprochement with the EU and Ukraine and its ambiguous attitude towards Russia are causing a reaction in the pro-Kremlin Russian media. One article, entitled ‘The EU’s “Eastern Partnership” Threatens to Turn Belarus Into a “Second Ukraine,’” published on 9 July by Russia’s government-affiliated Sputnik media in English, is a case in point. The author of this warning to Minsk was Vladimir Lepekhin, a former Russian politician turned political analyst. This is clearly more than his own personal opinion, as the text has been distributed by major Kremlin-affiliated media outlets worldwide. Before it was published by Sputnik in English, the article appeared in Russian on another Kremlin-affiliated website: the news agency RIA Novosti. This pedigree of the Lepekhin’s text made it another obvious black spot sent to Minsk. Likewise, Moscow’s steps in the security field show that the Kremlin puts little trust in its Belarusian ally. In his interview for El Pais, Belarusian foreign minister Makei complained that Russia and pro-Russian Donbas entities had also rejected Minsk’s offer to deploy Belarusian forces to enforce control on the Russian-Ukrainian border. In April, Russia also chose to promote an Armenian rather than a Belarusian as the new CSTO Secretary General, after it finally decided to replace Russian general Nikolay Bordyuzha. Bordyuzha had run this largely symbolic organisation, dominated by Russia, since its establishment 14 years ago. Thus, because of the changed security situation in the region, Minsk has adjusted its external relations to place more of an emphasis on neutrality. For the same reason, it has succeeded in improving its relations with Western and regional countries. At the same time, the Belarusian government continued to assure the Kremlin of its Russia-friendly policies. Combining these policies is a difficult task, as the regular outcries from Russia prove. Nevertheless, recent developments show that Minsk is already benefiting from this stance without encountering serious consequences. In other words, Belarus can continue to pursue neutrality.